How to Recover Deleted Files on Mac with/without Software? Whether you have accidentally deleted files or deleted them on purpose and now want to recover them on your Mac, there are several methods available. Since there is no Mac undelete feature, you will have to rely on other methods and third-party data recovery tools. We'll discuss how to recover deleted files on mac. Part 2. How to Recover Deleted Files on Mac without Software? When it comes to recover deleted files on Mac computer, the easiest way is to use a data recovery software. iMyFone AnyRecover is one of your best choices for this purpose. It can help you recover any kind of file with ease thanks to its user-friendly interface and powerful data recovery modes. You can recover everything you want via this tool e.g. photos, videos, music, documents, emails, archives, etc. AnyRecover supports data recovery from all storage mediums e.g. hard drives, flash drives, SD cards, digital cameras, music/video Player, etc. It allows you to preview your lost files before recovery. Highest successful data recovery rate in the market, find your lost files with lighting-fast speed. Step 1. From the Mac version of iMyFone AnyRecover, choose "Deleted Files Recovery" mode. Step 2. You'll be asked to select the location where you deleted your files. Click "Next" to start the scanning process for the location. Step 3. After scanning, AnyRecover will list all the recoverable files in a list sorted by file type, just pick up those you want to recover. 2How to Recover Deleted Files on Mac without Software? Step 1. Use the Mac's menu bar to find Time Machine and launch it. Step 2. Press the up arrow or swipe upwards with two fingers on your Mac's trackpad in order to navigate to a time before your files got deleted. Step 3. Once you have located the backup which contains the files you need to recover, click on the Finder window and then browse the Finder the way you normally do until you locate the files that you wish to recover. Step 4. Once you find the file you want to recover, use the spacebar button to preview it and then click Restore option. Your selected file will be restored. You can recover deleted photos on your Mac without third-party app (via the Photos app), providing that the photos were deleted from this app. This is because the Photos app has built-in album called Recently Deleted. This album keeps the deleted photos for 30 days before being erased permanently. 1. Launch Photos app on your Mac. 2. Use the Photos sidebar to navigate to Library > Recently Deleted. 3. Once there, choose your deleted photos, then find and click on the "Recover" button on the up right conner. Your selected photos will be restored to their original location. If you delete a song from iTunes on your Mac, it does not get deleted permanently and is moved to the Trash folder. 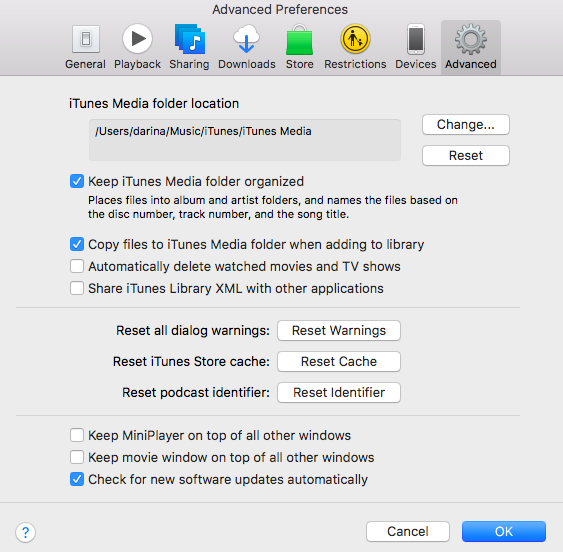 So, you can easily recover the music deleted from iTunes, providing that you haven't emptied the Trash. 1. Launch iTunes on your Mac. 2. Once it is launched, navigate to Preferences > Advanced. 3. Now find and tick the option called 'Copy files to iTunes Media folder when adding to library'. 4. After that, close Preferences and then open Trash and drag the music files from it onto the Desktop and then onto the iTunes' icon in the Dock. The selected music files will be added to iTunes library. Many built-in as well as third-party apps on Mac use a feature called versioning. This feature creates copies of the previous versions of the files and keeps them stored in case they are needed to be restored. You can use this feature to restore your deleted files on Mac. 1. Open a file on your Mac. 2. Click on the File menu and then click the Revert option. Then Browse all versions of the file. 3. Now find the version of the document that you wish to restore and click Restore in order to restore the selected version. Getting your important files accidentally deleted on your Mac can be frustrating. Fortunately, there are so many ways available for you to recover your deleted files on Mac. Before you try other manual methods for file recovery, you can try iMyFone AnyRecover as it will ensure a 98% recovery rata for your deleted files and has been trusted for over 1000000 users.